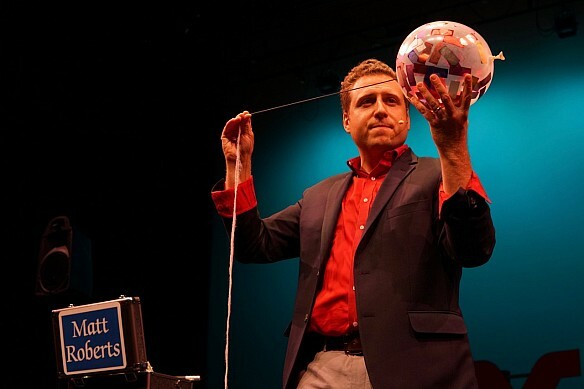 "Discover How Emmy-Nominated Entertainer, Matt Roberts Will Make Your Event A Success With His Engaging Brand Of Clean Comedy Magic, Mentalism & Astonishing Illusions, Tailored To Your Audience & Venue!" Your guests are important. Don't get stuck with inappropriate entertainment or a boring program. Eliminate the worry with the reliable pro who creates memories and makes YOU look like a hero. Send your details to GetMattFast@gmail.com , call or text 508.965.3489 or click here to fill-in a quick form for video, pricing and a proposal tailored to your needs. You'll get rave reviews. A nationally-awarded illusionist and trusted to represent Fortune 500 companies like CVS, Sony &Walmart in 30 TV spots with millions of views (seen alongside Entourage's Jeremy Piven, NBC's Al Roker & Ghostbusters' Slimer, performing on The Today Show and PBS, earning two EMMY nods) as well as being selected by Off-Broadway producers to travel to Times Square monthly to perform an ongoing run of his interactive magic show on 42nd Street, Matt is the versatile, easy-to-work-with, full-time performing artist who Pepperidge Farm called "an event planner's dream." ♦Stand-Up & Stage Shows: As seen Off-Broadway... Performed for your entire group, this highly-visible, CLEAN comedy magic show involves your guests in jaw-dropping & hilarious original routines. Matt is quick on his feet and has a real presence in front of a crowd. He tailors each show to your venue, audience & time-frame for a perfect fit. Whether predicting the future, making objects float, transform, vanish, pass through each other or presenting his twist on one of Houdini's famous feats, this smart, different,'WOW-factor' combination of laughs and illusions for audiences of any size makes a potentially ordinary event extraordinary, adding a fun and impressive high-note to your function or performing arts season that they'll talk about long after the award-winning finale. ♦Strolling Close-up: As performed for The New England Patriots... Based in sleight of hand, mystery and personal interaction, Matt's roving 'Mingle Magic' happens right under your guests' noses, with many of his illusions taking place in their hands. Selected cards are found in impossible ways, minds are read, predictions come true and objects transform and animate before your eyes. A perfect icebreaker, you'll be thrilled when you hear the laughter and gasps from small groups as Matt performs his unique combination of sophisticated magic, mentalism and smart, clean humor throughout the venue, delivering astonishment to your guests. *Custom illusions, speaking, consulting & M.C. services are also available. Rest easy: With 12 shows for GE, bookings at The Waldorf Astoria at Walt Disney World, creating magic for Goldfish®, Bananagrams® & Make-A-Wish®, a decade of 'Music & Magic' productions from Boston Symphony Hall to The Phoenix Orpheum, his ongoing Off-Broadway run, 12 years of performance contracts at Mohegan Sun, amazing representatives from all 8 Ivy League Schools and many more corporate, fundraiser, theater, resort, private party and event production clients in 32 states and a dozen countries, Matt Roberts is the flexible expert you can trust to make any-size function impressive & fun--guaranteed. For an idea of Matt's interactive style and the enthusiastic "WOW!" reactions he gets from his many repeat clients, check out this short video: click here. Click here to fill out the fast form for pricing & show details customized for you! Get Matt Fast: GetMattFast@gmail.com or call/text 508.965.3489 today. "An exceptional entertainer with effortless charisma and perfect comedic timing...Extremely professional and well prepared. He possesses top-notch communication skills. He answered all of my questions thoroughly... We sent a survey regarding the event. Here is what people had to say: “He was amazing!..a great choice. Entertaining and funny without being inappropriate at all...Terrific idea. An unexpected treat...he was fantastic!” Matt is personal, charming and highly entertaining...Highly recommended!" Matt has been appearing in front of audiences for 20 years. Trained in improv, with a Bachelor of Arts in Theatre, the real magic is how he brings the signature spontaneous, quick comedy style that has kept him in-demand on screen, to his live shows, interacting with your guests for a personal, one-of-a-kind, award-winning experience. Matt travels nationwide for bookings. He was honored by his peers with national awards at Abbott's 75th Stage Competition, a legendary event for magicians from around the world. He was hired to later perform there alongside top performers from Hollywood & Las Vegas, including some of his heroes: veteran corporate magicians and Academy Award Ceremony entertainers Dana Daniels & Mike Caveney. After seeing Matt's act from the front row, Las Vegas-headliner Mac King said, "you killed!"... See photos here. 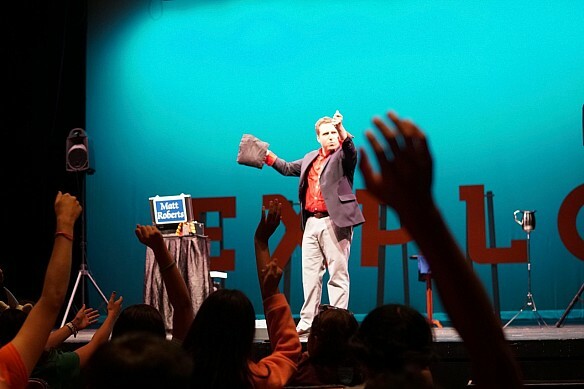 "Feedback from our employees is that this was the best ever...and I can truly say it is due in large part to your hilarious and amazing magic show! You were perfect for our eclectic group, keeping everyone sitting on the edge of their seats the entire time and I highly recommend you for any occasion... You were a pleasure to work with...so easy and dependable. An event planner's dream. Thanks for making me look good and thanks for giving our employees a fantastic afternoon they will never forget!" -Chris June, Executive Assistant to the President, Pepperidge Farm, Inc.
"Just wanted to let you know how much everyone enjoyed your magic/comedy show...Your presentation was so entertaining; it was very funny and highly engaging. They say you can't please all of the people, all of the time but I think we did! I only heard positive comments after the event. Thanks again for a great show!" -Rob Beams, Vice President Supply Chain, Ocean Spray Cranberries, Inc.
"I had so much positive feedback from your magical performance! You were entertaining, intriguing and thoroughly enjoyable. It made our Company Meeting an "event" and one that our employees will remember for years to come. Thank you again for your time and great performance." -Liz Matthews, National Resource Management, Inc.
"I've been getting a lot of kudos this morning thanks to you! Your act was a great way to top off our holiday office party last night. You are a great addition to any gathering and I'll be passing your name along with high praise to family and friends." - Debbie Peck, First General Realty Corp.
Click here for a no-obligation price quote. For more information, please fill out the above form, email your event details to GetMattFast@gmail.com or call 508.965.3489 today. Text and layout copyright 2018 Matt Roberts. Show content and attire may vary from photos. All Rights Reserved.